As can be implied from the title, Bobbie Mendoza Saves the World (Again) is the follow-up to an earlier appearance of the titular character in The Naughty List. One does not need to have read The Naughty List to understand what happened to Bobbie since this book does a pretty good—if not too thorough—re-telling of the events of the first book that would eventually lead her to save the world (again). While I’m sure the previous book was focused on Christmas-related shenanigans, this book opens up the potential for weird, random, and bizarre via the same inter-dimensional portals used previously. I will say that I was impressed with this book’s ability to seamlessly intertwine verbal narrative with accompanying pictures. It’s not quite a picture-book, but it’s also not a chapter book either. It’s a hybrid of the two. While I’m assuming the illustrations will be a little more polished for the final release (I was given an advanced reader copy to review), the drawings still conveyed the necessary information in a rough and squiggly way that seemed to work well for the type of plot presented here. Intended for kids in grades 3 through 7, Bobbie Mendoza Saves the World (Again) pulls out all the stops when it comes to the randomness of its comedy. From unicorns to dinosaurs to elves, the silliness of the situations will probably make most children laugh. Parts felt a little immature for 7th-graders, but other sections had words and concepts that were perhaps a little too complicated for 3rd-graders. I’d probably say that this book would be appropriate for grades 4 through 6. Parents might have to suffer through the fart jokes and random plot points (without a strong main point or lesson behind them), but at least it’s a somewhat entertaining book to read. 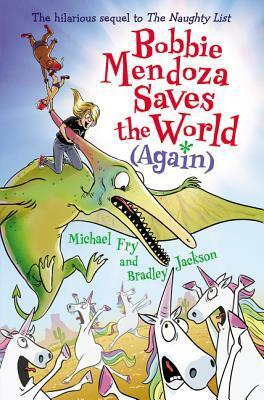 A book filled with the “random” comedy that appeals to kids, I give Bobbie Mendoza Saves the World (Again) 3.5 stars out of 5.